Followers of Traditional Chinese Medicine believe that magnets increase energy and stamina, promote wellness and faster recovery, and help circulation which promotes pain relief. 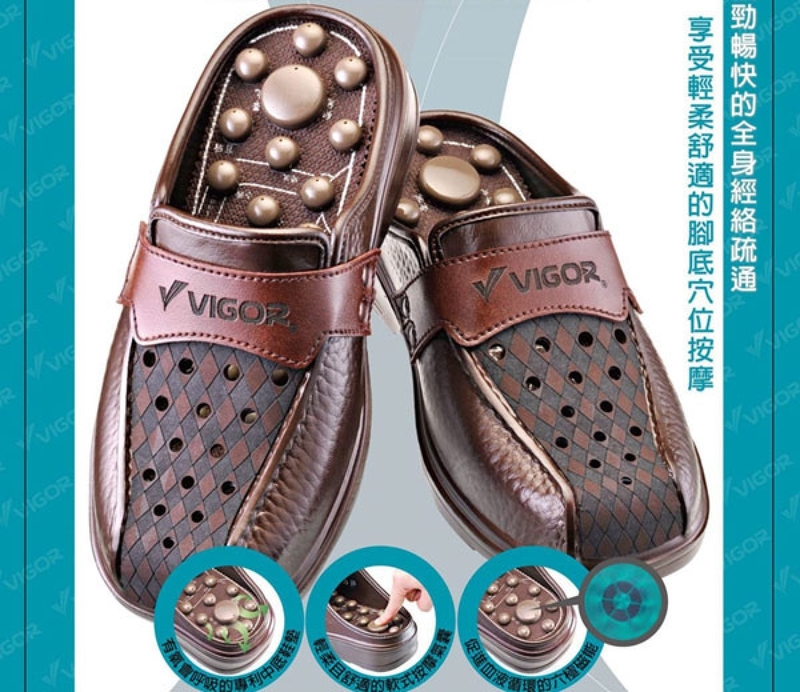 Consists of 34 acupressure points in each cushioned sole pad to help to massage the soles. Consists of 68 well-ventilated small holes within the oxygenated air pockets which allows heat and moisture to escape and enable air exchange and circulation. According to the theory of Reflexology, nerves corresponding to organs are concentrated in the Sole Reflex Zones, and stimulating these nerves on a daily basis can contribute to improving the health of organs and muscles. The Bio-Magnetic Air Reflexology Shoes are designed to stimulate these nerve pressure points in your feet. About two-thirds of leg muscles work together to pump blood back toward the heart. Veins concentrate in the sole. According to the theory of Reflexology, properly pressing and stimulating them promotes blood flow, supporting heart function. When various reflex points are stimulated they induce a healing response. If sensitivity or tenderness is experienced this indicates bodily weaknesses or imbalances, and with repeated wear these channels of blocked energy can be cleared resulting in improved health. 1. 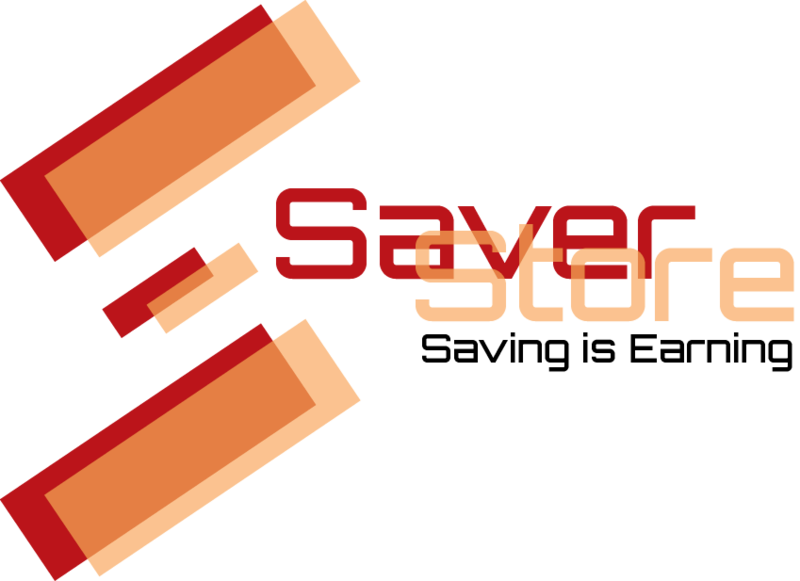 EVA soles to prevent slip as it is surface resistant. It is also shock-absorbent. 2. Patented Air Acupressure Massage Pad: TPE material which can be recyclable and will retain its elastomeric characteristics while continuing to function in its application. 3. Specially engineered with fine perforations throughout the insole to absorb perspiration so feet stay drier, and they help to control the odor. 4. 6 Bio-magnets (professed to help circulation and pain relief by followers of Traditional Chinese Medicine). 5. The cushioned soles ensures total comfort for the wearer. The massage insole stimulates areas of the sole of the foot which correspond to all the glands, organs and parts of the body. The rubber (latex) insole nodules act like tiny fingers, applying pressure to the sole of the foot. As in Shiatsu and Reflexology healing techniques, the Bio-magnetic Air Reflexology Slippers massage the feet when you walk, stand or sit with even light pressure on the sole. It has been believed for thousands of years that stimulating the individual Reflexology Zones on the sole contributes to the health of organs and muscles. Shiatsu therapists massage the soles of the feet in order to stimulate the body’s energy flow and rebalance the body. When various reflex points are stimulated they are believed to induce a healing response. 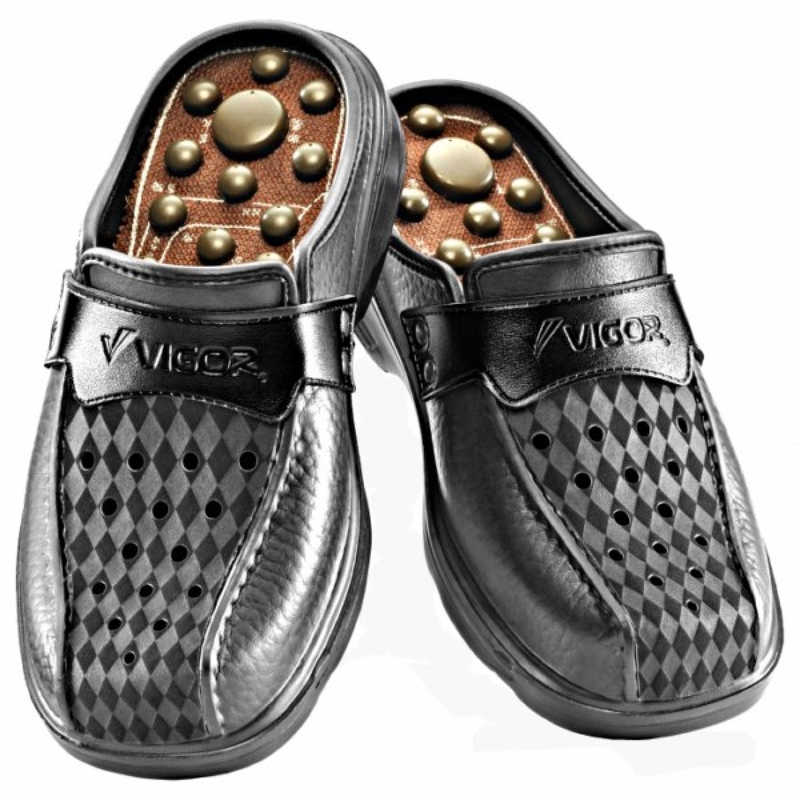 Standing on the Bio-magnetic Air Reflexology Slippers creates a feeling much like that felt during a Reflexology massage session. Key nerve endings are stimulated which energizes organs, body functions and blood flow. 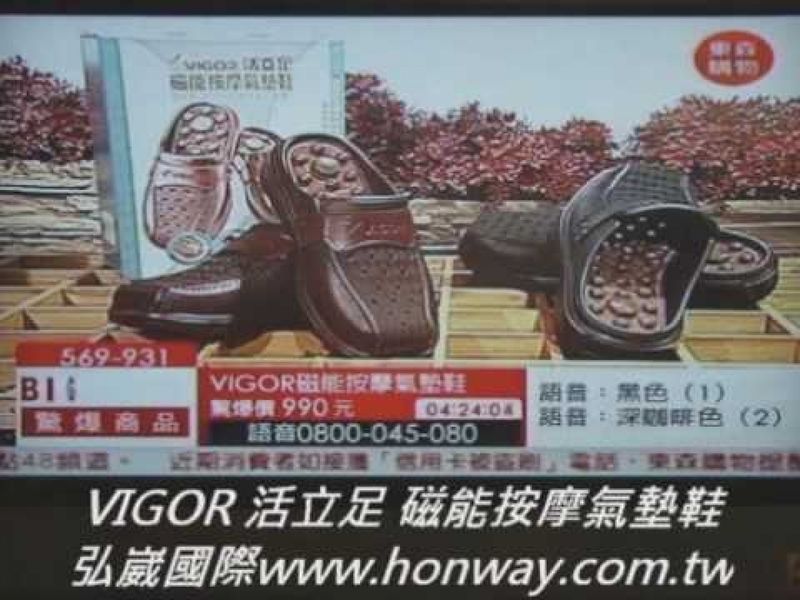 Walking in the Bio-magnetic Air Reflexology Slippers creates a rhythmic pressure on the soles of the feet similar to the rhythmic massage of a skilled Shiatsu therapist. 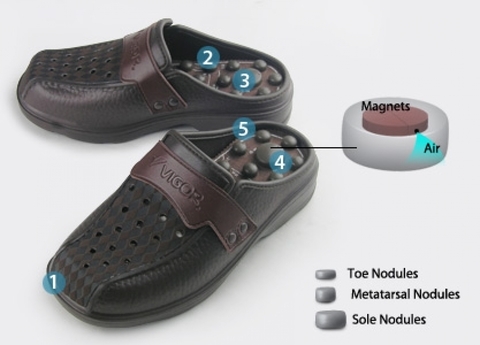 The Bio-Magnetic Air Reflexology Slippers Arch Fit System combines the comfortable massaging ability of natural rubber (latex) nodules and the shock-absorbing qualities of the elastomer midsole. Walking or Shifting your weight compresses the center of the massage insole, enabling the natural rubber nodules to stimulate and massage the soles and edges of the feet. The BIO-Magnetic Air Reflexology Shoes incorporate the traditional art of natural healing and magnetism. 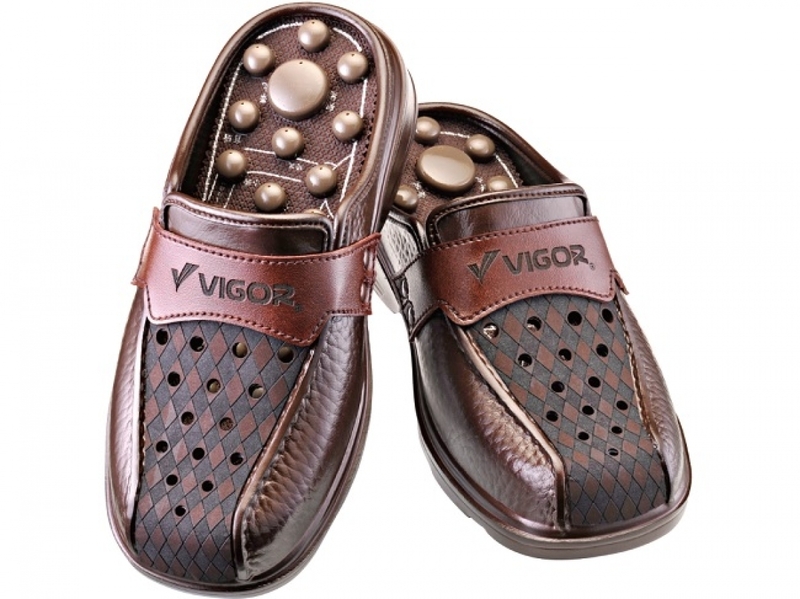 The air pockets massage the feet and there are tiny holes on each air pocket to enable better ventilation and comfort. The air pockets also feature 6-Poles BIO-Magnets to help balance the body’s natural static electricity, magnetic field and positive and negative ions to enable better blood circulation. · 6 Poles BIO-Magnetic Rings: Balance your body’s static electricity and magnetic field, allowing positive and negative ions to flow smoothly through the entire body. · Acupressure Massage: 35-40 Acupressure points stimulate the soles, providing you a comfortable massage on-the-go. · Compressible Air Pressure Pockets: Exert appropriate amount of pressure according to your weight, providing better cushioning and air ventilation. 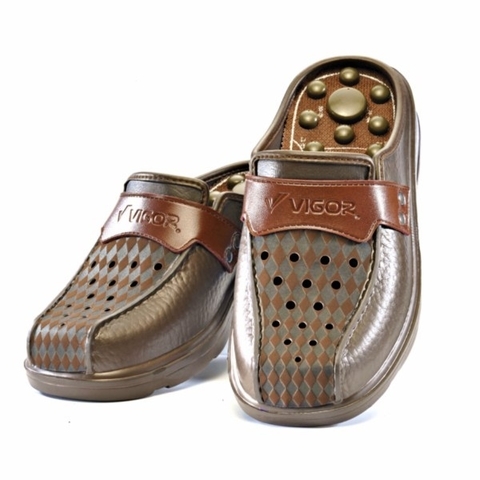 · Comes in 2 colours: Brown/Black (Please indicate colour in &apos;Remarks&apos; when purchasing). *Please indicate your size in &apos;Remarks&apos; when you make a purchase.